Tired of needy companions who go down quickly in battle and can’t carry much? 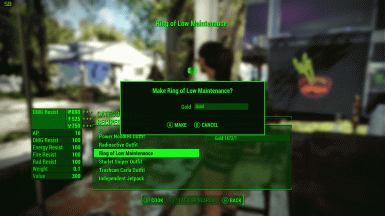 This mod adds a craftable Ring of Low Maintenance to the game. Equip on your followers and they will be much tougher in battle + able to carry more + better at sneaking. Also has jet pack effect, medic pump, and water breathing if you want to equip on player. - The additional items are craftable at any Chemistry station under the Utility section. If you craft the ring and then equip it on a companion or settler, they will last much longer in battle so you don't have to stimpak them in the middle of fighting. You can equip the ring on the player as well if you want good armor protection without needing to wear a ton of armor, or if you need a temporary or permanent boost to carry weight. Important: This mod only works if you EQUIP the ring on your follower (or equip on yourself if using on the player character). If you merely put the ring in inventory and forget to equip it, there won't be any changes. 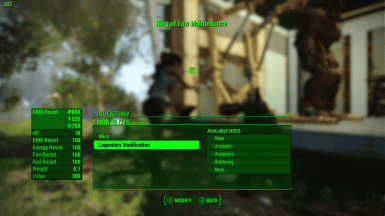 - (v1.1) Added "Low Maintenance BOS Hood" to equip on Danse. - (v1.1) Added "Low Maintenance Dog Collar" to equip on Dogmeat. 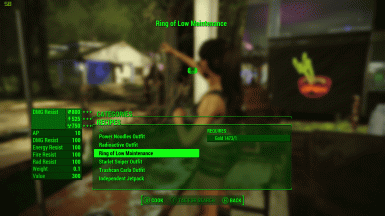 - (v1.1) Added "Low Maintenance Sunglasses" if you want to equip instead of or in addition to the Ring of Low Maintenance. Shouldn't be any conflicts. These items are standalone and do not override any files for NPC, armor, game settings, object effects, etc. There are other mods that make companions tougher by overriding the NPC files. This mod takes a different approach, so it should play nice with any other mods you have that make tweaks to companions.